School organizations and institutions who value the balance of their employee’s work and personal lives ensure that proper employment benefits are granted to every individual who will be hired. One of the basic benefits that employees must be awarded is the availability of leave opportunities. 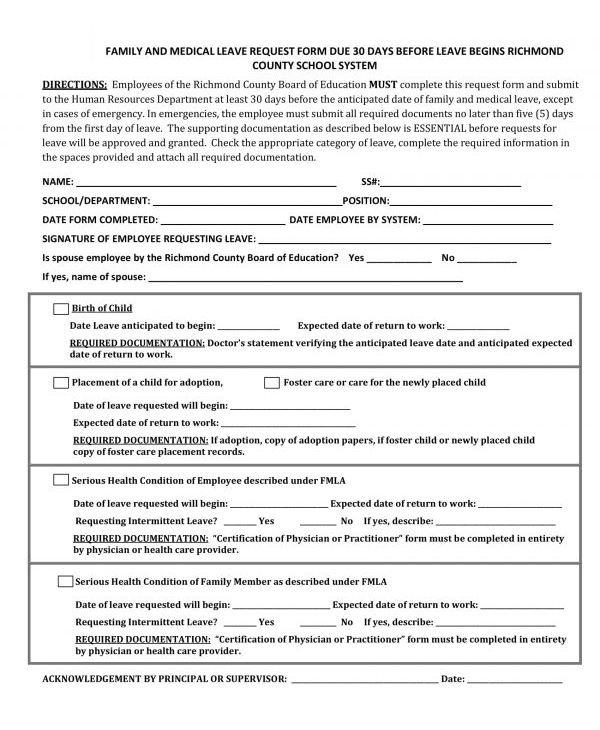 With this, the school management and administration must create family and medical leave request forms that will be used by their employees for filing leaves related to family and medical health reasons. 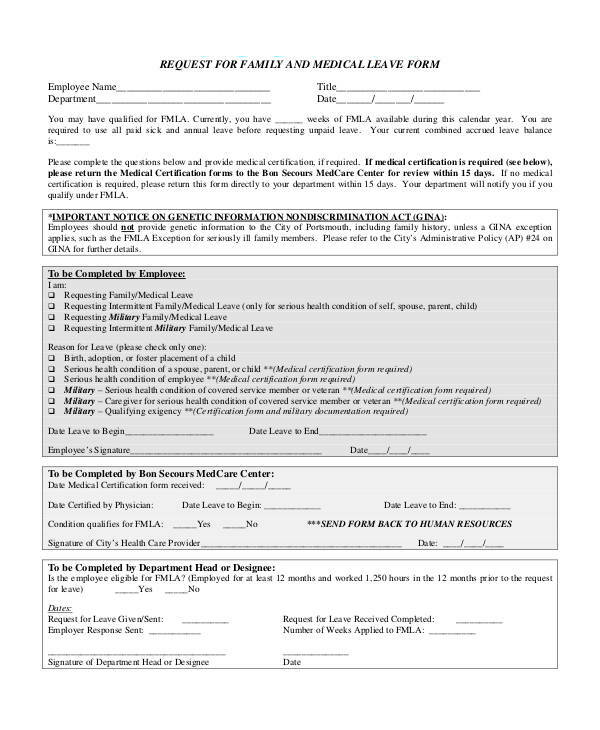 What Are Family and Medical Leave Request Forms? 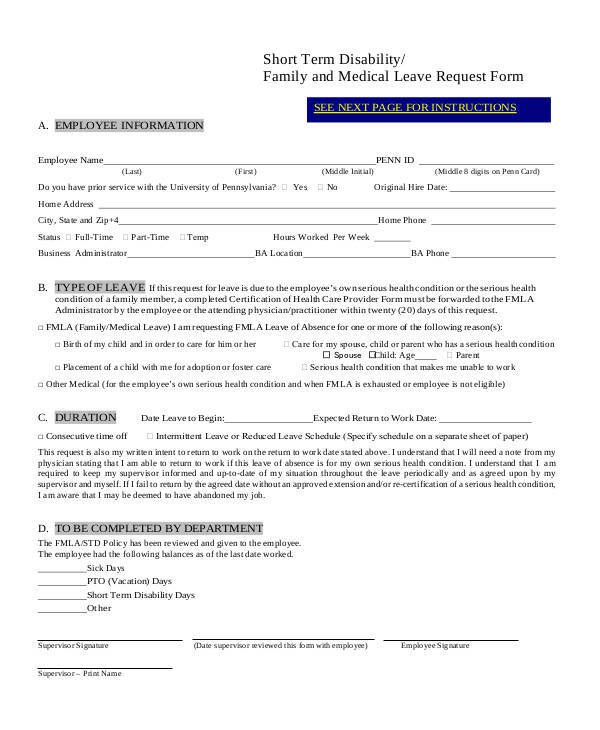 Family and medical leave request forms are documents that are essential for gathering the details of a school employee’s and staff’s leave intentions. 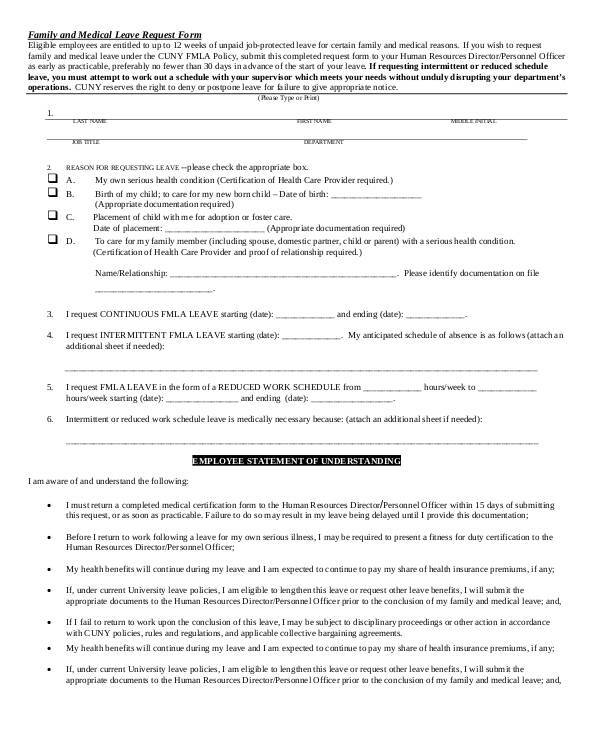 The form must only be used by a requester who will be leaving his service hours for reasons that are related to family matters and emergency medical concerns. 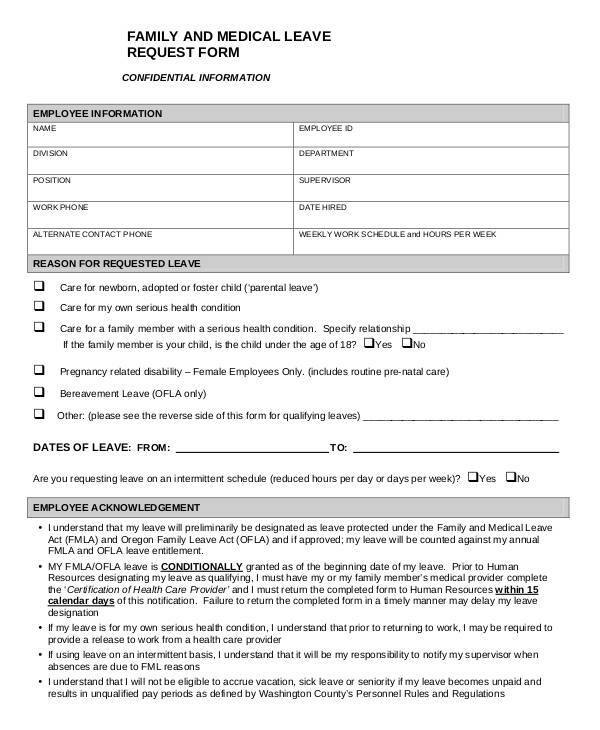 If the school faculty and staff or employee will file a leave request due to other reasons, he must use a general type of leave form. 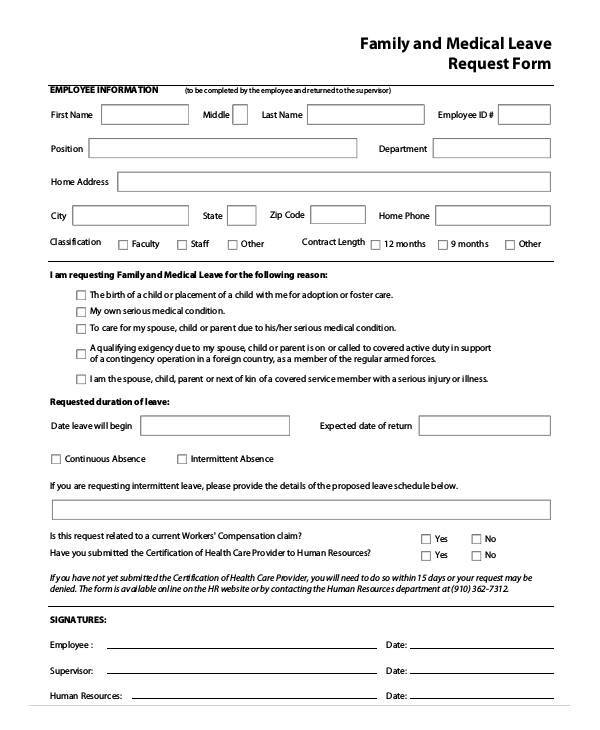 Schools and every company or organization who hires employees and staff as their main source of manpower must prepare and use family and medical leave request forms. The primary reason for using this document is to meet and comply with the rules and regulations of an organization with regards to keeping records and reports of an employee. Also, proper documentation is significant for the human resource, payroll department, and the corporate management of the school or educational institution. This allows the management to determine if an employee or a staff has used his accumulated leave within the year of his employment. In connection with the importance of the leave form for the payroll department, it is used mainly for knowing whether the employee on leave will be paid for his absence within the leave period or not. Without the records of the employee, the payroll forms and the human resource department will not be able to prove their computations to the employee’s salary payment request form. The significance of an employee information section is evident in the process that will be conducted by the school administration or management in recording the request. The data that will be disclosed in this section will focus on the identity of the employee such as his employee or staff number, the school department where his job position is aligned, and his daily schedule form. Moreover, this section can also include fields that will collect the contact information of the employee, which must be current and available in the period of his leave. This is to ensure that the school administration and the head of the employee’s department can call the employee or send notice forms and emails related to the employee’s job that was left vacant as the employee fulfills his leave. 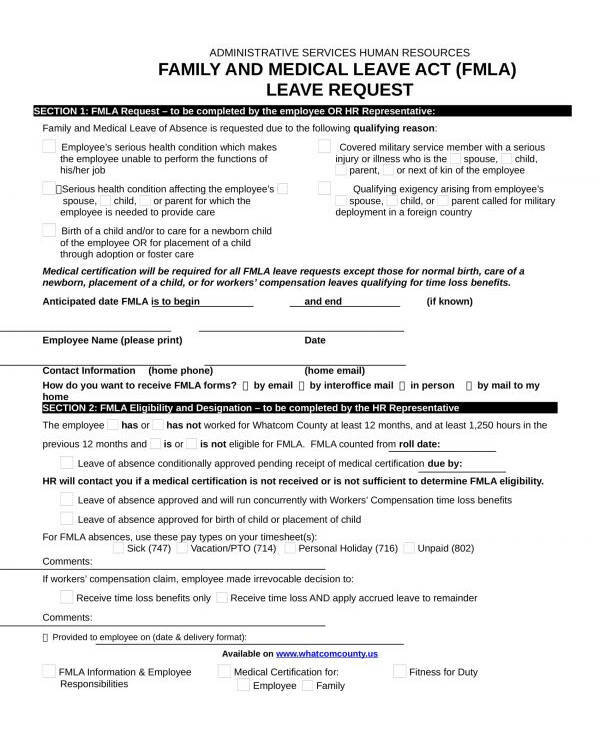 Since a family and medical leave request form document caters two intentions, the employee must distinguish his leave category in the form’s leave information section. The reason of why the employee will be filing the leave must also be stated along with the number of days and hours that the employee will not be able to report to his office. 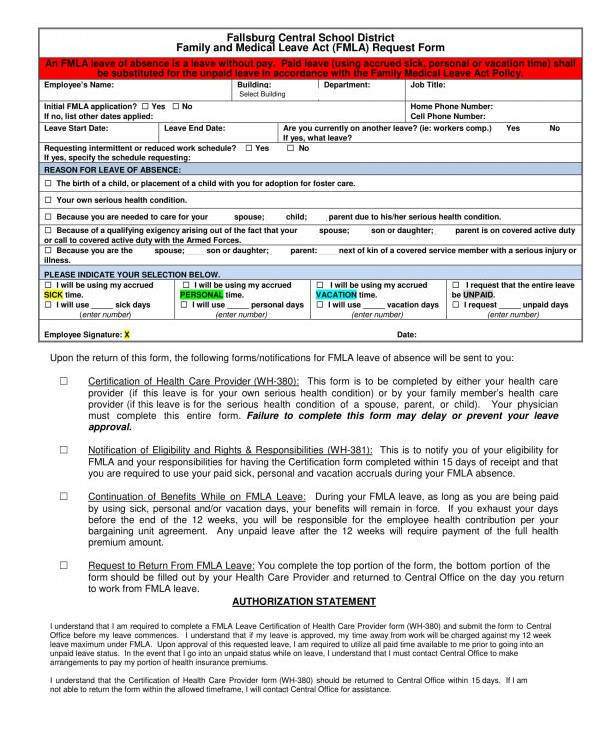 Additionally, the administration must indicate or enlist the types of forms and documents that the employee will be needing upon his return such as a certificate form provided by the employee’s health care provider for medical-related leave requests, and a return request form signed by the employee’s supervisor and head of the department in the school. Incorporating an expense authorization statement allows the management or the school administration to define the roles and the obligations that the employee must accept when he files the leave request. Roles pertaining to the necessity of presenting the requirements for the leave and the obligation of the employee to inform his manager or head officer for his leave extensions are some of the common inclusions in the statement forms to be agreed and signed by the requesting employee. Creating any type of education form that the school faculty, staff, students, and clients will use in a specific procedure is easy; however, the school or the creator of the form must ensure that the document will only gather the significant information to be used to cater the needs of the user. 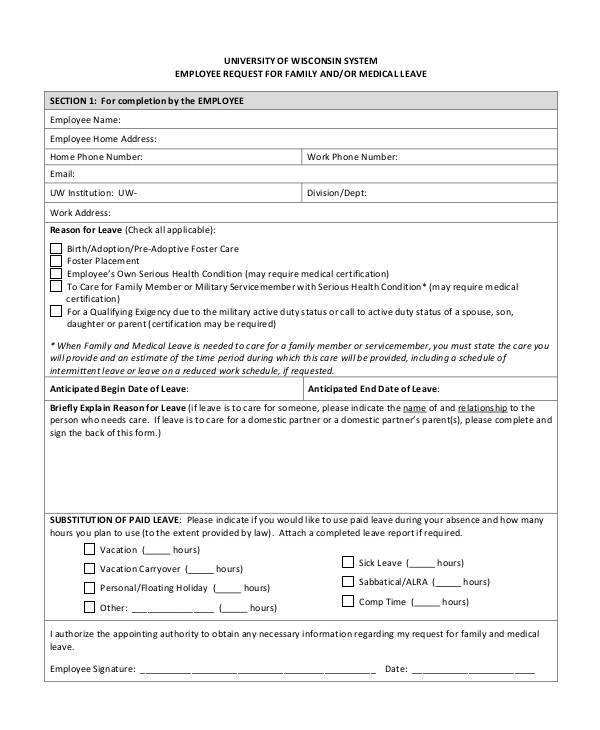 When it comes to creating family and medical leave forms, the creator must take into consideration the length of time allotted for the requester to fulfill and complete the request form. For achieving a minimal time in completion of the document, the fields and required entries must be kept minimal as well, focusing only on what is essential to be collected from the requester. By this, the creator should first make a draft and enlist the types of data to be required and categorize each data into associated groups to have an organized field arrangement. you may also see Free Medical Forms. 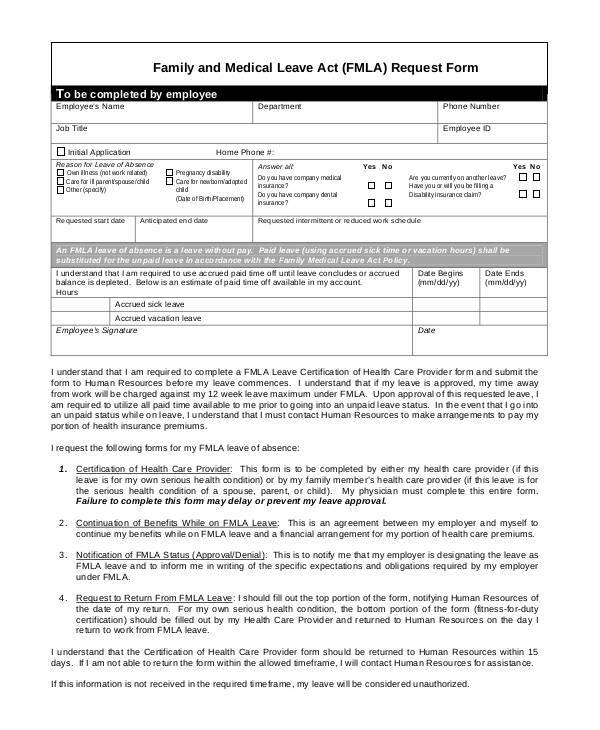 Another tip to be kept in mind when making family and medical leave request forms is to inform the user of the confidentiality aspects of the form and the honesty and accuracy required to be observed when completing the form. These pieces of information must be indicated in a statement included in the form and must be signed by the user. Moreover, the completed form must only be submitted to the assigned personnel of the school who will be handling the procedure for determining the administration’s decision for the leave request. Lastly, the form should include a list of requirements that the requester will have to comply and submit. The requirements are basically documents that will prove the requester’s need for the leave as well as to aid the management or the administration in documenting the requester’s absence and return in the school premises. you may also see Medical Forms.